Creating the perfect ambience for a wonderful shopping and queuing experience! 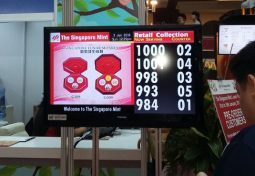 The Singapore Mint is Singapore's very own mint as well as a global player in lifestyle products and services relating to currency, collectibles and premium gifts. Every year, The Singapore Mint organises their annual Lunar Fair to cater to the market's demand for their extensive range of gifts and collectibles. During the fair, proper management of the queue was vital in order for an overall pleasant customer experience. Hence, our packaged media and queue system was deployed to serve this purpose. 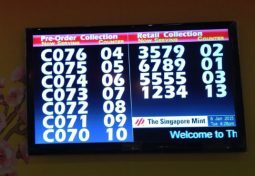 As our Media and Queue System is available on a short-term rental basis, The Singapore Mint does not have to spend huge sums to invest in an expensive system to be used for just a few days. And since access to the Web KeyPad, which is used to call for queue numbers, was via their existing mobile equipment, it further lowers the overall cost. At the same time, with the Web Keypad, there is no space-taking physical queue-calling counter keypad and messy wiring, both of which are important considerations in a packed area. 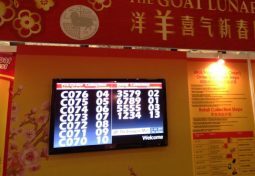 The marketing team also made full use of the Visual Display units installed at various spots of the fair. Not only were they used to play background music to enhance the ambience at the roadshow, they were also cleverly used to show videos of their products to both customers who were waiting for their turn as well as to people who were browsing around. 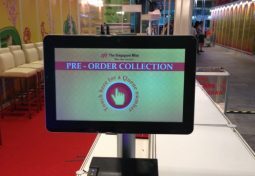 Superb customer shopping and queuing experience – perfect! 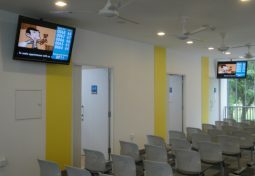 National Healthcare Group Polyclinics (NHGP) is a leading public healthcare service provider in Singapore, playing an important role in providing a comprehensive range of health services for the population.To handle the large number of patients at its polyclinics, NHGP requires not just an effective and reliable media and queue system, but also one that could meet their unique requirements. And we are proud to have supported NHGP for the past few years with our customised media and queue system at the various polyclinics. In providing quality healthcare to the patients, the doctors and nurses make use of a customised internal Patient Management System for recording medical information etc. In order to minimise the inconvenience to the staff by the use of multiple systems when attending to patients, we have customised our media and queue system to work and interface seamlessly behind the scene with NHGP’s internal Patient Management System. In this way, the staff will feel that their workflow is smooth and efficient with a single integrated system. 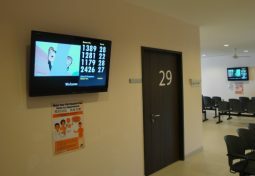 In order to meet the varied needs of the different departments in each polyclinic, we have customised the queue information on the screens of the Visual Display Units based on the requirements of each department. In this way, uniformity in design style is achieved without compromising on what needs to be shown on the screens. Improving customer experience and organisational productivity! As Singapore’s leading healthcare service provider, National Healthcare Group Polyclinics (NHGP) offers affordable healthcare services to a significant portion of the population. In providing the best experience for its large base of patients, NHGP is constantly looking for ways to improve all aspects of its operations, including in payment services. And this is where our self-service payment system come in perfectly. 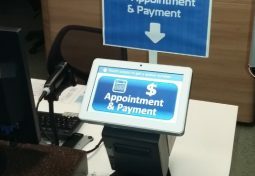 Patients using our customised self-service payment system saw their waiting time significantly reduced, especially during peak periods, with time spent on payment being about 60% faster compared to payment at the counters. And as more patients chose this self-service payment route, queues and waiting time for payment at the counters are also correspondingly reduced! 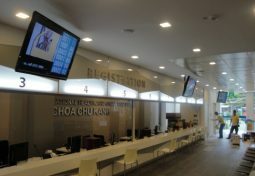 With the use of the self-service payment system, less payment transactions are processed at the counters. In this way, the freed up time and resources can be devoted to more individualised attention and of course better service to patients who still require the help of a staff when making payment. After operation hours, smart features such as automatic daily settlement and report of cash collections continue to contribute to operational efficiency and productivity. looking to help your customers queue happier or pay faster?